Our busy schedules often require us to make sacrifices, but sacrificing sleep for beauty shouldn’t be one of those. To allow you to hit that snooze button a few more times, we’ve put together a list of easy hair extension ideas that you can complete quickly but still look fashionable. Rocked to perfection by Cara Delevingne, the messy bun is the no-fail hairstyle. Remember: The messier, the better. The side braid is the easy hairstyle that looks like you’ve spent hours on it. To rock it like Rita Ora, start a tight braid near the top of the ear and be sure to loosen the pieces after you’ve secured it. Since growing out her pixie cut, Emma Watson is the queen of the low bun. To pull this look off, allow a few pieces of hair to fall around the face. Top knots are once again making a comeback thanks to Kylie Jenner, who’s been seen wearing the style on and off the red carpet. Use a fine-tooth comb to get rid of any bumps on the scalp, and be sure to use hairspray to tame flyaways. This version of the low ponytail offers an instant facelift and a sophisticated style for the office. To get Kim K’s polished look, use a shine serum. The messy version of the low pony works great for ladies with bangs like Taylor Swift. Bonus: This look requires no product. This braid looks complicated, but it’s as simple as reversing your French braiding technique. Go for a single Dutch braid like Kim Kardashian or double it like Rita Ora by using a centre part. Take a note from Emily Blunt’s beauty book and braid the front section of hair, from your part to just above your ear. Add some texture spray to your hair to get those Emily Blunt waves. Move your messy pony up to your crown for a rockstar look. Tease the base of the pony for added height and pull down some face framing pieces, like Little Mix’s Leigh Ann Pinnock, to take it to the next level. Young stars like Zendaya Coleman know how to rock a beanie. 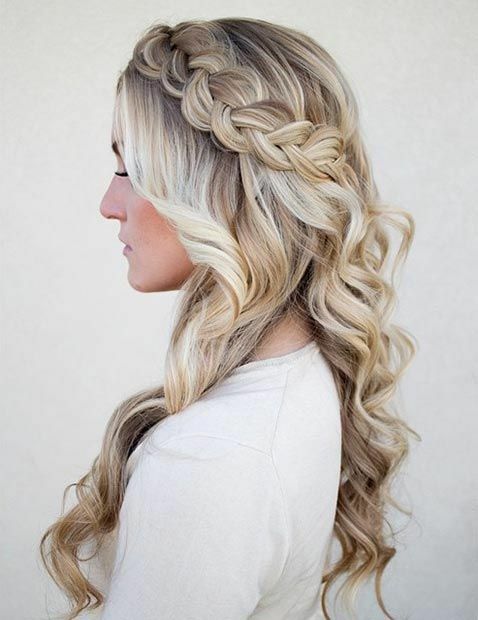 To get the look, separate your hair into two sections and then curl both large pieces. Run your fingers through it, set it with hairspray and then add your beanie of choice. Curly haired girls like Little Mix’s Jesy Nelson know that it’s important for your hair’s health to occasionally go natural. Add some curl cream to avoid frizz. To add some volume to second-day hair, use a far side part on the opposite side of your usual part. This is always useful for fine haired girls like Ellie Goulding. The half-up bun offers a quick and easy way to look put together without the time commitment. Copy Poppy Delevingne’s look by loosely securing your hair below your crown. The best part of the side-twist is that it works for girls of all hair types. Use a side part, like Sarah Paulson, and twist the smaller side of the part to just behind the ear. The beauty of the headband bun is that you only need one item: an elastic headband. Secure the headband over on top of the hair, and then tuck the end of your hair under it. Feel free to take this opportunity to add some flair by using a decorative headband like Lydia Hearst. Follow us on Instagram and Pinterst.